Stir in turkey and mixed vegetables. Remove from heat. Spoon into crust-lined pie plate. Top with second crust; seal edge and flute. Cut slits in several places in top crust. Bake 30 to 40 minutes or until crust is golden brown. During last 15 to 20 minutes of baking, cover edge of crust with strips of foil to prevent excessive browning. Let stand 5 minutes before serving. Use leftover holiday turkey or a rotisserie chicken for the filling—and if you have leftover roasted or sautéed vegetables (like peas, broccoli, or green beans), coarsely chop them up and stir into the sauce in place of the frozen veggies. A 1/4 to 1/2 teaspoon of poultry seasoning, which is heavy in dried sage, stirred into the filling is a natural complement to a turkey pot pie. Use a small cookie cutter to cut out vent holes in the top crust. Attach the dough cut-outs around the edge of the pie, using a little bit of beaten egg. Beat an egg with a spoonful of water and brush it over the surface of the top dough before baking for a glossy, golden crust. Sprinkle the egg washed dough with a dusting of grated Parmesan or sesame seeds if you’d like. It’s hard to find a more comforting dish than a classic pot pie. 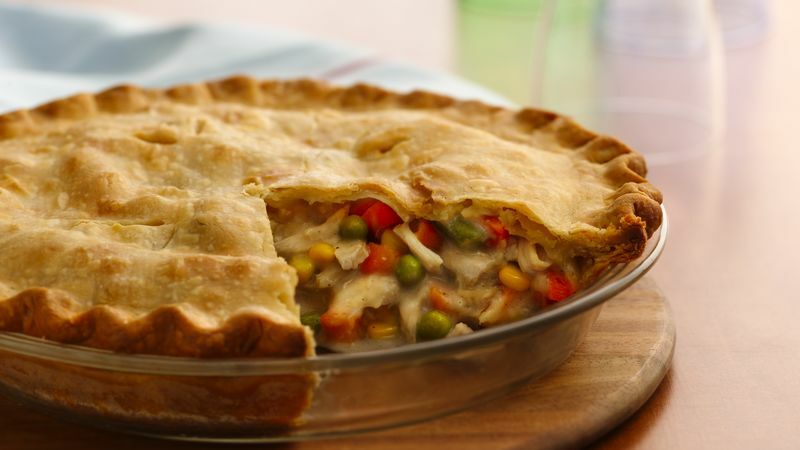 Sometimes referred to as meat pot pie, the traditional recipe is typically filled with some type of protein, mixed vegetables, potatoes, chicken broth and flour inside a flaky pastry crust. Surprisingly, the humble pot pie has a colorful history dating all the way back to the Roman Empire when it was a common dish served at royal banquets. Instead of tender chicken, beef or turkey baked inside, these historical pot pies were often filled with live birds! The pot pie became a standard dinner in Europe around the 16th century and was later introduced to America by the English settlers. Now, the pot pie has become commonplace and has found a longstanding spot in weekly dinner rotations. The savory pie has certainly come a long way since its origin and today, there are plenty of different methods to bake the savory meat pie and endless twists on the classic recipe. You can make pot pie using biscuits instead of pie crust, you can make the filling on the stove or in the slow cooker, you can bake the pie in a casserole dish or a pie plate, and you can even bake it in a skillet or a muffin tin! This dish can be adapted and tweaked easily by simply changing out the filling. The flavor options are endless with twists like buffalo chicken pot pie, chili pot pie or even pizza pot pie. Whatever you’re craving, we have every pot pie and casserole recipe you could ever dream of!